Turn down the lights, close the curtains, and put on some Barry White. You’re going to need it. 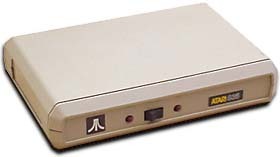 My first exposure to modems was a 300-baud Atari acoustic coupler modem that a friend of mine had (this was 1983). I bought an Atari 300-baud direct-connect modem not long after. It sucked because the only software for it was on a cartridge and you couldn’t upload/download files. Eventually, I bought a used 850 interface (had a real serial port) and Hayes Smartmodem 300. Ehh, my first contact was way later than 1983 (well, it would be hard for me back then by the virtue of beeing born that year 😛 ), in 1998 or 1999 at the place of my highschool buddy who had a few year old PC with 33.6k ISA modem – soon after, in 2000, I got my own PC with 56k Lucent winmodem, at a time when modems finally became sort of popular at my place – earlier it had relatively thriving 8bit and Amiga scenes, but very few used modems, largely due to it beeing Europe where you paid by the minute… Luckily quite quickly, in 2002, I changed to unmetered connection (a sort of ~DSL, Ericsson HIS / Home Internet Solution, 115/70 (when line was used for a voicecall) kbps, still connected / visible to OS like an external RS232 modem), and never looked back. But I think the model in the article is a bit newer. Not to nitpick, but curious where the 1965 claim comes from – apparently DB-25 variants started to be introduced in 1970 (and the one we see in the photo probably didn’t solidify until later). According to the wikipedia article on DB-25. **EDIT**: I see the author, based on other grounds, estimates the year to be closer to 1970, at least. But I’d guess later actually (speaking as a complete nonexpert).